You are here: Home > News > Current Northside Plans Deemed Refused. 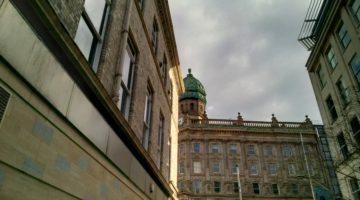 The Ulster Architectural Heritage Society has been informed by Belfast City Council that application for the Northside Regeneration Plan is currently deemed refused. UAHS understands this to be the case because an environmental statement, or extension to time to submit, was not received by the applicant by the 15th January 2016 (6 months from the EIA determination). UAHS had previously objected to the application. 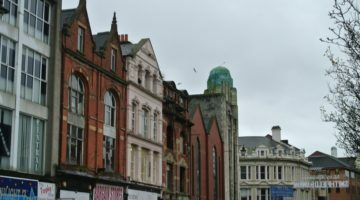 It was our opinion that while the North side of Belfast was in need of regeneration, an alternative scheme should be developed giving greater consideration to both listed and unlisted buildings of architectural and historic interest within any redevelopment scheme. In recent weeks, considerable momentum has developed in favour of the retention of built heritage in the Northside area, to which UAHS is lending advice. This has centred around a campaign to protect the Sunflower Bar and the wider, undesignated area from demolition. Nearly 30 objections had been received before the application was closed. Whilst the deemed refusal is welcome, it is not based on proposals to demolish, rather insufficient submission of information on the part of the applicant. The deemed refusal does not mean that unlisted historic buildings in the area are safe. 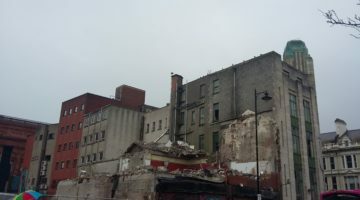 They are not protected against demolition and it is likely that another scheme for the area will emerge in due course. UAHS will continue to highlight that Northside presents an opportunity whereby historic buildings can be treated as catalysts for positive change, capable of sensitive integration with new build within the area. The fact that the application is now not imminent, gives opportunity for the community, developers and Belfast planners to improve future plans. The blend of old and contemporary architecture can produce an attractive, sustainable and productive Northside. We will keep you updated on our website with any further development, meanwhile you can monitor new planning applications in your area by visiting the Northern Ireland Planning Portal. https://www.planningni.gov.uk.